What does culturally sensitive charity work look like? Firstly, on reflection of what I do, I'm not sure I like the word charity. It conjures up images of 'doing something to or for' another group... I would prefer to consider what I am involved in as a partnership. 'Walking with' my like minded friends on a significant journey, one that aims to provide resources and hold out a hand to others who may be struggling. So the question on culturally sensitive work for arises when I think about embarking on this journey on another cultures soil. I recognize that I am coming into their space, and in doing that, I am at risk of influencing this space with my values and presence. So how do I do this in a culturally sensitive way? I remind myself frequently that I am a member of a powerful part of the global community, and the power attributed to me because I am white, educated, rich, and from a democratic society, means I have the power to influence.. but that's not what I want to do, I want to offer my capacity, as a peer and friend, to the cause for change that is meaningful and desired by this community. I am so lucky to have found local friends, in the NGO ODAM , with whom I share similar values. We gave developed a relationship where i believe we bounce ideas off each other. I bring my limited experience in community development, and my lifetime of Englisher and working with stakeholders. 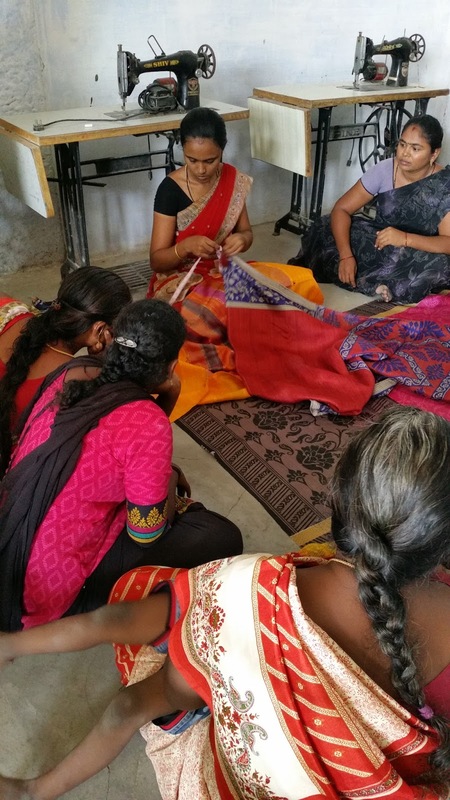 My partners bring their intimate knowledge of the life of the women of south India. They know the political and economic environment we are are working in, they know what wont work and what might work. I think whats most important in culturally sensitive aid work is to remember I am not an expert here, i am a student. In my work, i bring ideas, i ask questions, and i participate in conversations equally. Prior to coming to India my friend & i had this idea for a Fairtrade business but I was concerned we had not developed these ideas in a true collaboration with our friends here in India. So in our first meeting, a very long day of discussions, my friend and I prepared ourselves to frame our idea in a way that allowed, even encouraged, debate and change. To our great surprise, and excitement, our idea fitted exactly what our partners in India wanted to do.. we were on the right track. The past 10 days have been exciting and eye opening, as we've embarked on a partnership in this business venture. But this comes with nervousness and concern.... we hope we can make it work, and the promise of employment for these rural women will be realized. This is so exciting, Tamara. I'm pleased the business idea was well received and now you can go onto bringing it into actuality. With your passion and knowledge of the people who are making the things you sell, I think you'll be able to convey to your future customers an excitement of what their support can bring. I like the term partnership, especially now. I wrestle with those words and usually discard charity which sounds almost more self-serving than outer serving and I have no idea why I say that, but it sounds a little self-righteous. Volunteerism or outreach seem to me better words. But you have truly become partners. Even when I travel I always try to remember that I am a guest in that country -- even if I'm a guest who invited herself! And it's amazing what you learn when you approach travel in that way -- all good.